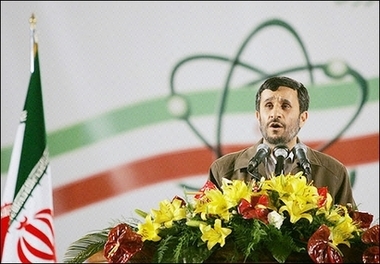 President Mahmoud Ahmadinejad, pictured April 2007. Washington will continue to press for sanctions against Iran, despite the failure of existing measures to deter Tehran's controversial nuclear program, US officials said Wednesday, as cracks began to show in international unity on the sanctions question. Ick, what a bad caption. Give us a real good one, please. Entries will remain open until 11:59 PM, Central Standard Time, Tuesday, May 22. 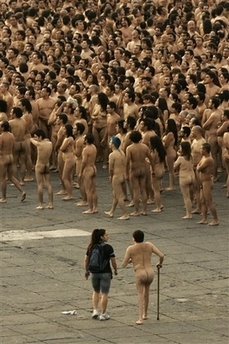 Submit your captions in the comments section, or email at mccracken.ken@gmail.com. Captioning: it's the only way to go. Enter today! Thinking: Too many drinks last night has my head all woozy. This week's entry: "In preparation for his summit with Hugo Chavez, Iranian artists draw a rendition of Ahmadinejad wearing a sombrero." President Mahmoud Ahmadinejad threatens sanctions against Willisms.com if there are no new posts between Wednesdays. ... because I forgot my pants. Up and at 'em, Atom-inejad! "I am practicing my Hebrew." When former President Mahmoud Ahmadinejad sat up in his coffin during his funeral, it was proven that Iran had been working on a Nuclear Life Regeneration Accelerator device and not an atomic bomb. Alright! Who gave me the Plutonium aspirins? OMahma-omahma Ahmadinejad, twin sister of the President of Iran, recieves the traditional bouquet and giant tiara as she is un-veiled as Miss Iran. She will, at her brother's request, wear the veil in next Monday's "Miss Universe Pageant" in Mexico City. "Not tonight honey,I have a splitting atom bomb." Sporting his new "Armagedon Halo",Iranian president Mymood-I'minajihad swears to the slaughter of every non-muslim on the planet to which, every single major news entity on the planet responded with an expose on the evils of the C.I.A. (including classified/top secret material).